Carol Shennan, professor of environmental studies, will lead a team of researchers and stakeholders around the country who are optimizing biological methods to manage soil-borne diseases and pests. The grant builds on Shennan's leadership in the development of alternatives to methyl bromide and other environmentally harmful soil fumigants used to combat soil pathogens. She and UC Santa Cruz research scientist Joji Muramoto have adapted a clever strategy called anaerobic soil disinfestation (ASD) for strawberries. ASD combines short-term saturation with the application of an organic amendment like rice bran under plastic mulch to temporarily create anaerobic conditions in the soil; that results in "fermentation" processes and changes the microbial activity in the soil prior to planting, killing off pathogens like Verticillium dahliae that can devastate berry fields. Unlike methyl bromide, which dramatically reduces microbial activity in the soil, ASD shifts microbial populations in ways that suppress targeted pathogens. "It stimulates disease-suppressing mechanisms," explained Shennan. The technique has received significant interest in California, which produces more than 80 percent of the nation's strawberries; more than 20 percent of the state's organic strawberry acreage uses ASD to manage soil disease, said Shennan. "Because it's a biological process, its effectiveness depends on the environmental conditions—soil type, soil temperature, carbon sources, pathogens, and water management," she said. "Heavier soils are more difficult because you don't want clods. Farmers also have to do this at the right time to get the soil temperatures needed to kill off pathogens, and they may need different carbon sources depending on which pathogens they have." The goal of the USDA project is to develop region- and pathogen-specific management systems so farmers can use ASD in combination with crop rotation and disease-resistant strawberry varieties. This "integrated systems" approach is the best way to address environmental and biological variables and increase the reliability of pathogen control. "ASD is not like a fumigant that's going to work wherever and whenever you apply it," said Shennan. "It's more knowledge-intensive. For strawberries, it's currently the best alternative to fumigants to control Verticillium." Other barriers to the widespread adoption of ASD include the variability in soil types and the need for equipment to spread tons of rice bran, grape pumice, or other organic matter on fields. Shennan's team will survey farmers about their experiences with ASD to learn more about who uses it, what works, and what prompts growers to abandon the technique. "It's easier to do on some soil types than others," acknowledged Shennan. "And the mechanics take some working out." "We've been doing this for 14 years now, getting an accumulation of data from greenhouse experiments and field trials," said Shennan. "This grant will allow us to analyze the data from all those trials, as well as new trials, in a comprehensive way so we can develop decision guidelines for farmers in each region." 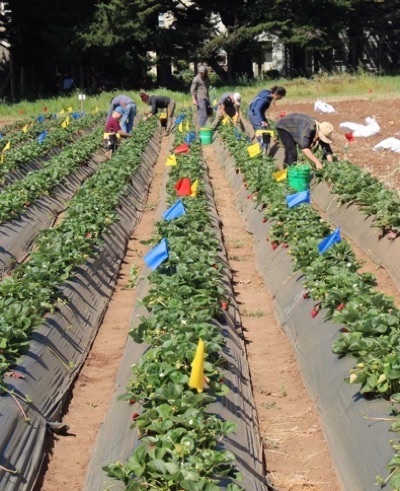 Since the phase-out of methyl bromide, two diseases have emerged as significant challenges for strawberry growers on the Central Coast: fusarium wilt and charcoal rot, which are triggered by fungi that are well-adapted to local conditions. "Fusarium is difficult to control in the central coast of California with ASD alone because of the cold soil in the fall when it is typically done," said Shennan. Her team is now developing ASD strategies tailored to these additional pathogens, including summer ASD combined with more resistant cultivars. 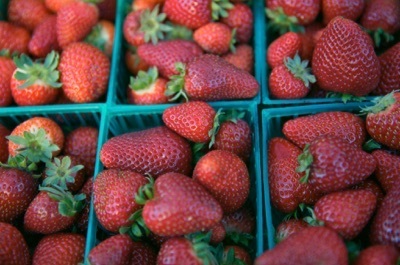 Strawberries are a $2.8 billion industry in the United States, employing more than 80,000 workers. But the phase-out of methyl bromide and other fumigants has posed a significant challenge for berry growers around the country. Shennan's team will address the needs of growers in California, Florida, North Carolina, and Tennessee. This project will focus on strawberries, but Shennan hopes to be able to apply what her team learns to get a "head start" on how to design systems for other crops. Like soil fumigation, ASD is a fairly expensive technique, which limits its use to specialty crops that fetch a higher price at the market. Researchers in Japan and the Netherlands are experimenting with ASD in greenhouse crops, asparagus, and tree seedling production, while scientists in Florida are conducting field trials with tomatoes, peppers, and eggplant. A consortium of researchers, farmers, and other stakeholders has collaborated with Shennan to develop ASD strategies, which growers are now using on about 1,500 acres of strawberries and raspberries in California, according to Shennan. "That's up from one acre five years ago," she noted, adding, "None of this would have happened without our partnership with Farm Fuel in Watsonville, which delivered carbon sources and provided technical assistance to growers early on." In addition to Muramoto, Shennan's collaborators include Mark Mazzola, a research plant pathologist with USDA's Agricultural Research Service in Wenatchee, WA; Oleg Daugovish, a farm adviser with UC's Cooperative Extension in Ventura County; and Erin Rosskopf, a research microbiologist with USDA's Agricultural Research Service in Florida.